If 7 is your lucky number, then the seven inch size of quilt block is for you! 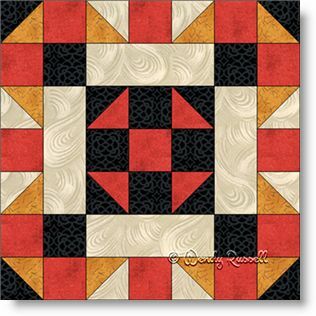 It is not all that common in use, but if you are wanting to make smaller blocks, this category of block is a just a scaled down version of any 14" quilt block. This Greek Cross quilt block version is for those who want a little more detail than the simplified Greek Cross block. Once your basic skills are established you might want to move on to this interesting version. Seven patch quilt blocks are not as common as others, for the obvious reason that there are many more pieces in the block. However, once you want to challenge yourself a little, try out this verion of the Greek Cross. It is made with the most basic of shapes in quiltmaking -- squares, rectangles and half square triangles, so the only important consideration is careful attention to the precision of your quarter inch seams. Lots of interesting setting arrangements can be made with this quilt block, and a few are illustrated in the sample quilts shown.